Justin Bieber will be the first in a series of music artists to feature in a new digital outdoor campaign by Universal Music and Global Radio's Capital FM. The campaign, which breaks today on Outdoor Plus-owned digital billboards, promotes artists signed to Universal’s label and will give commuters real-time updates when they are playing on Capital FM. Planned by MediaCom, the first ad will promote Bieber's album Purpose. A custom built code will simultaneously trigger the Bieber creative to be displayed on the DOOH screens for the duration of the track’s airplay. The ads will run in conjunction with the Capital playlist, rather than on a timed digital out of home ad loop, which Global says is the first time this has been done. 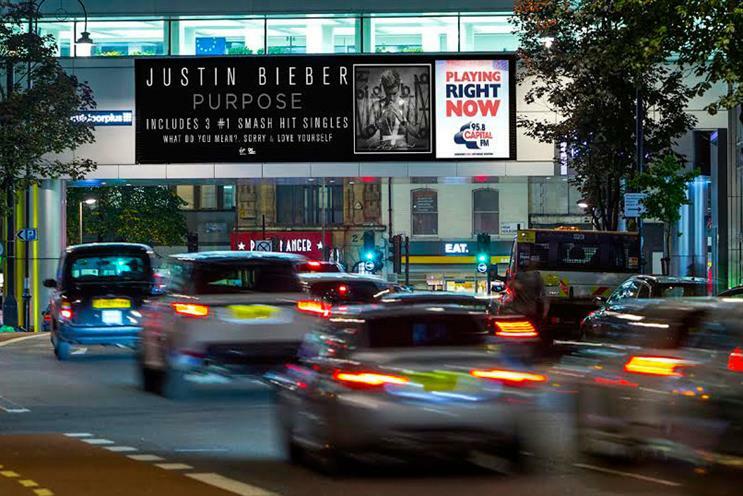 A dynamic feed, provided by digital signage specialist UniLED, will link the Capital studios to Outdoor Plus sites across London, and determine in real-time when a track from Purpose is playing on the radio station. Adam Johnson, the director of marketing at Global, said: "We’ve seen that digital out of home gets commuters to tune into Capital. This campaign provides a dynamic call-to-action to for people to engage with both Capital and Universal Music artists." Is commercial radio's audience rise due to BBC budget cuts?